With an event as big as New Year’s Eve, sometimes a party alone isn’t quite festive enough. Which is why Paws Up is inviting you to a New Year’s weekend like no other! Beginning with an elegant five-course dinner in their award-winning restaurant, Pomp, the festivities don’t end until a lavish breakfast buffet the next morning. In between, you’ll enjoy games, prizes, a bonfire, an extravagant fireworks display, all set to live music from the awesome Crystal Bowersox. 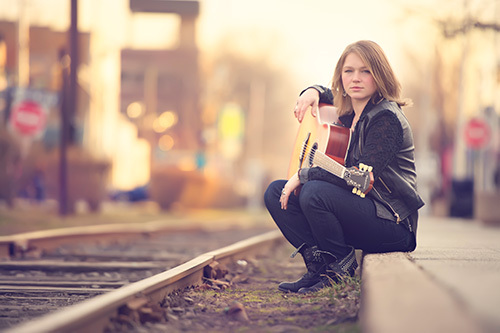 Crystal's emotive folk-rock-country style was catapulted from the cramped coffeehouses and cavernous subway tunnels of Chicago into millions of homes across America when she placed second on Season 9 of American Idol. Along with her old soul of a voice, her care-free style and "don't mess with me" attitude set her apart from the other contestants on the show, and eventually landed the self-taught songstress performances with the likes of the legendary Joe Cocker, Harry Connick, Jr. and Alanis Morrissette. It’s sure to be a stunning show! When you’re all partied out and ready to turn in, you can catch up on your sleep in your own luxurious home. Featuring a fireplace, hot tub and sumptuous beds, you’ll really feel like you’ve escaped to a wonderland of palatial rustic glamour at The Wilderness Estates, a collection of luxury ranch homes nestled a world away from the everyday. Whatever you can imagine is at your fingertips - total indulgence and complete relaxation. This secluded wilderness sanctuary comes complete with panoramic vistas, total privacy and an extensive list of features, including a great room with a soaring vaulted ceiling, a cook's kitchen and a loft game room. Lastly, the three master suites feature en-suite master bathrooms outfitted with a spacious slate shower, a jetted spa tub, sumptuous spa products and plush towels. You’ll feel like royalty! Winter in Greenough, Montana is a time for any sport that makes use of a land blanketed by white. The Resort at Paws Up offers over a hundred miles of lightly traveled wilderness trails for a diversity of unique Montana winter vacation excursions. For those who yearn to explore the great outdoors of Big Sky Country, we feature unforgettable adventures, like dog sledding, cross-country skiing, snowmobiling, tubing, private indoor equestrian lessons and even ice skating - all in winter wonderland full of peace and magic. If given some time off, Jack Frost would certainly choose to spend his holidays relaxing here after weeks of winterizing the world! For more information, call: 800-473-0601 or Email and let the ranch know Top50 referred you!